A high school senior who is battling a brain tumor and recovering from a broken hip managed to score a date, as well as a black tuxedo with a pink tie, for the Arroyo Grande High School prom. 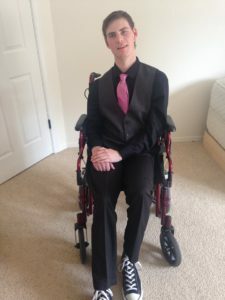 Then, about 48 hours prior to the big event, the Lucia Mar school district passed along a message that the wheelchair-bound student was not welcome at the prom. Jared Springer, 18, could not go to prom because he had been absent from school for an extended period following a recent accident in which he fell out of his wheelchair and broke his hip. His absence from school disqualified him from attending school events, the disabled student’s father, Frank Springer, said in a Facebook post. Lucia Mar’s director of student services informed Frank Springer of the rule during a phone call late in the day on Thursday. The Arroyo Grande prom took place Saturday night. During the phone conversation, the district administrator said Jared Springer could only go to prom if he received clearance to attend school from a doctor and his family met with district officials to discuss logistics. That gave the Springer family one day to jump through impossible hoops, Frank Springer said in the Facebook post. In Oct. 2014, Jared Springer suffered a stroke and brain hemorrhage, causing him to spend 20 days in a coma and five months in the ICU. He was diagnosed with a pilocytic astrocytoma brain tumor. This year, Jared Springer returned to school for his senior year at Arroyo Grande High. About three weeks ago, he fell out of his wheel chair and broke his right hip, which required emergency surgery. Following a 10-day rehab, doctors released the Arroyo Grande senior but instructed him not to go to school for six weeks. The doctors said it would be too painful for him to bounce around campus in the wheelchair. During Jared Springer’s last week in rehab, all he would talk about was going to prom, his father said. His nurses cleared him to go to prom, and he was very excited about going. But on Wednesday, one of Jared Springer’s support teachers called Frank Springer and said Jared would not be able to attend prom. Frank Springer did not receive an explanation from the district until late in the following day. Frank Springer also said he offered to go to the prom with his son. The district’s student services director said Frank Springer could not accompany his son because he did not have a background check and a tuberculosis test. Also, the district does not let parents go to many school functions, the Lucia Mar administrator reportedly said. On Saturday night, Jared Springer went with his date to dinner to the Madonna Inn. Their classmates were attending prom at a location down the street. Jared Springer returned home a little mad and upset. He had been looking forward to seeing his friends, listening to music and finally having a little fun at prom, his father wrote. “In the Lucia Mar Unified School District, we believe that our work is about students and maximizing their academic and extracurricular opportunities. It saddens me to know that with improved communication one of our students may have been able to attend an event that is special for many high school seniors. We have reached out to the parents to meet and discuss this situation in person and are awaiting their availability. “At the same time, student safety is a top priority in our District. In order to protect all our students and staff, we have specific rules about who is allowed to participate in school-sponsored events. We acknowledge that there may be ways to work within guidelines to expand opportunities for our students. “In our decision making regarding eligibility to participate in extracurricular events Lucia Mar USD complies with all medical restrictions outlined by individual health care providers to ensure the health and safety of each child is taken into account. We make the best decisions we can, at the time, based on the information we receive from doctors. The Ed code does not require this. They could have easily let the father go. Many schools have dropped the TB requirement if the parent signs a paper saying they haven’t been in certain places. There was no excuse for this idiotic behavior. Recall the board for employing such a lame superintendent. The rule barring prom attendance due to missed school days is and was meant for kids with disciplinary problems as in truants. School admin knows this and we know it. No rule is meant to punish a sick/injured child who missed school due to said illness/injury. If Jared had a clean record (no disciplinary problems) even if he missed enough school days to have to attend summer school before diploma, he is technically a senior and shouldn’t be barred from prom. “Where in the world is that Lucia Mar School Board? The Board could have directed the Superintendent to make an exception to policy, in this case, especially since the district did not notify the parents in a timely manner. It is the Board who makes policy and it is the responsibility of the Superintendent to uphold policy, but this one is a “no brainer”. Bureaucracies exist primarily for their own preservation. This is clear. But I don’t think anyone should be fired over this. I do think there should be a real apology that says “we really screwed up”. And , and if there are real leaders in Lucia Mar, they will use this opportunity to point out that rules are meant to serve the people, not to govern them. Governing is done by humans, with brains and guts and common sense and compassion, not by rules. This letter of explanation is pure cowardly stupidity. The principal was too cowardly to make a decision for him or herself so he kicked it up to the superintendent who was too cowardly to make a decision so he kicked it to the lawyers who were too cowardly to just say, “do the right thing and let him go.” They all got in a circle and said we have a policy and we can’t make an exception otherwise someone will test us with something crazy and we will get sued and lose our jobs. No one had the courage to think this through. That is the problem with government and government schools nowadays. They are run by lawyers afraid of lawyers. Shakespeare was correct. Government is always about procedural crap rather than common sense. Isn’t this the same school where a teacher knocked up a student and got to keep his job?